Hearing loss is a decrease in the ability to hear. It can vary in degree of loss and occur in one or both ears. There are three parts of the ear. Problems that contribute to hearing loss can occur in one or more of these parts. Hearing loss is one of the most common health conditions in the United States. Although it affects people of all ages, the numbers increase significantly with age. Hearing loss is the most common birth defect. Approximately half of the cases of hearing loss in children result from genetic factors. Problems during birth or soon after can also lead to hearing loss, such as lack of oxygen, severe jaundice, or bleeding in the brain. Two of the most common causes of hearing loss in older adults are presbycusis and tinnitus. Presbycusis develops slowly as a person ages, especially after age 50, and continues to worsen. It is caused by a combination of hereditary and environmental factors, including exposure to noise and smoking. This condition makes it hard for a person to hear normal conversation and tolerate loud sounds. 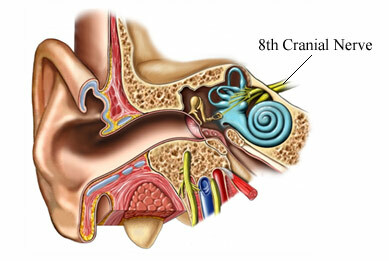 It sometimes involves permanent damage of the inner ear structures or nerve pathways in the ear leading to the brain . Tinnitus is ringing, hissing, or roaring sounds in the ears. It can occur with any kind of hearing loss and often is caused by loud noise or certain medications. The condition can also be a sign of other health problems, such as allergies and heart and blood vessel conditions. Tinnitus can occur on and off and can stop completely. There are 3 main types of hearing loss: conductive, sensorineural, and mixed. Conductive hearing loss is due to problems in the outer or middle ear that interfere with sound passing to the inner ear. It usually involves a decrease in sound level and can often be corrected by medical or surgical treatment. Sensorineural hearing loss is due to damage to the inner ear or the major nerve pathway that goes from the inner ear to the brain. In addition to a decrease in sound level, it also affects the ability to understand speech. This type of hearing loss is permanent. It cannot be corrected medically or surgically, but it can be treated with hearing aids and assistive devices. Mixed hearing loss is due to a combination of both conductive and sensorineural hearing loss. What are the risk factors for hearing loss?What are the symptoms of hearing loss?How is hearing loss diagnosed?What are the treatments for hearing loss?Are there screening tests for hearing loss?How can I reduce my risk of hearing loss?What questions should I ask my healthcare provider?Where can I get more information about hearing loss? Basic facts about hearing loss. Hearing Loss Association of America website. Available at: http://www.hearingloss.org/content/basic-facts-about-hearing-loss. Accessed December 31, 2018. Hearing loss. NIH Senior Health website. Available at: http://nihseniorhealth.gov/hearingloss/hearinglossdefined/01.html. Accessed December 31, 2018. Hearing loss. Healthy Children—American Academy of Pediatrics website. Available at: https://www.healthychildren.org/English/health-issues/conditions/ear-nose-throat/Pages/Hearing-Loss.aspx. Updated November 21, 2015. Accessed December 31, 2018. Hearing loss in children. Centers for Disease Control and Prevention website. Available at: http://www.cdc.gov/ncbddd/dd/ddhi.htm. Updated June 5, 2018. Accessed December 31, 2018. Isaacson JE, Vora NM. Differential diagnosis and treatment of hearing loss. Am Fam Physician. 2003;68:1125-1132. Type, degree, and configuration of hearing loss. American Speech-Language-Hearing Association website. Available at: http://www.asha.org/public/hearing/disorders/types.htm?print=1. Accessed December 31, 2018.